A small but highly efficient killing machine – a hornet two inches long and with a wingspan up to three inches – lurks in the mountains of Japan. The voracious predator has a quarter-inch stinger that pumps out a dose of venom with an enzyme so strong it can dissolve human tissue. 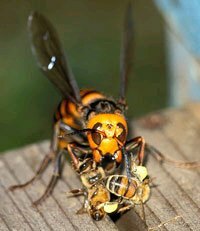 Bees, other hornet species, and larger insects such as praying mantises are no match for thegiant hornets, which often stalk their prey in relentless armies. Just one of these hornets can kill 40 European honeybees a minute; a handful of the creatures can slaughter 30,000 European honeybees within hours, leaving a trail of severed insect heads and limbs. Someone who is stung by the hornet and doesn’t receive proper treatment soon thereafter can die from the venom, which is powerful enough to disintegrate human flesh. About 40 people die each year after being stung by giant hornets, mainly as a result of an allergic reaction to the venom. This weekend the National Geographic TV series EXPLORER takes a close look at this powerful overlord of the insect world. The program, Hornets From Hell, airs Sunday, October 27, at 8 p.m. ET/PT on MSNBC. European honeybees are a favorite target of the giant hornets. Commonly used by Japanese farmers, the honeybees are not native to Japan and have no natural defenses against an onslaught of giant hornets. Once an enterprising hornet scouts out a bee colony, it marks the nest with a type of bodily chemical substance called a pheromone. Soon, a horde of giant hornetseach hornet five times larger than a European honeybeearrives to decimate the colony. The annual cycle of life and death begins anew each spring on the Japanese island of Honshu. As the cold weather fades, giant hornet queens awake from six months of hibernation. Inside, they carry the eggs of those who will be the hive’s workers and soldiers. A hornet queen lays thousands of eggs that take only a week to develop into larvae. The size of a hornet hive grows quickly as the season progressesand so does the ravenous hunger of the young hornets. The queen feeds her young at first, but soon an army of hornet hunters is dispatched to surrounding forests in search of more food sources. The hornets are highly industrious while their season lasts, relentlessly slaughtering other insects and building the size of their hives. As cold weather approaches, the giant hornets’ dominance comes to an end. The queens lay unfertilized eggs that will become the male hornets that are needed to fertilize a new generation of queens, which in turn hibernate until spring arrives again. Adult hornets feed their young by chewing the flesh of their victims into a gooey paste that the offspring devour. The larvae are well fed, and in turn provide the adults with a powerful energy-boosting cocktail in their saliva. It’s called vespa amino acid mixture. Regular doses of this “Hornet Juice” from the larvae give giant hornets their incredible stamina and energy when pursuing prey, they can travel a range of 60 miles (96 kilometers) at speeds reaching 25 miles per hour. The incredible effects of hornet juice have not gone unnoticed in Japan: The country’s latest sports drink is based on this “hornet power.” It contains a synthetic form of components in the hornet larval saliva, which is touted as performance-boosting. Japanese gold medalist and world-record marathon runner Naoko Takahashi declared that hornet juice gave her an edge in the Olympic Games held in Sydney, Australia. In Japan’s mountain villages, the hornets are valued as part of the basic diet. They are eaten deep fried, or even as hornet sashimi.